According to Anupam Singhal, cofounder of Monaeo, two out of three Fortune 500 companies get audited every year. And although there are surely several companies that get audited simply because they were unable to pay their taxes, most of the time it’s simply due an unfortunate case of miscalculation. What Monaeo offers is a software platform that helps companies track their employees solely for location based tax information. You see, when a company sends out their employees on business trips and the like, you have to understand that each state and country has their own separate set of tax codes. Depending upon where an employee has been, and how long that particular employee was working at that area, the amount of taxes the company will need to pay for the employee’s expenses can differ drastically. Today, most companies track where their employees have been through spreadsheets and the like. As you can imagine, it can be truly nightmarish for accountants to calculate where all of their employees have been over the space of a year come tax day. In fact, it’s a fairly common practice for companies to over pay their taxes for fear of being audited. What Monaeo does is provide a location based software platform that essentially keeps track of where each employee has been. Once Monaeo’s mobile app has been downloaded to each employee’s phone, Monaeo provides a overlay of where the employee has been, and how long they were at their particular location. 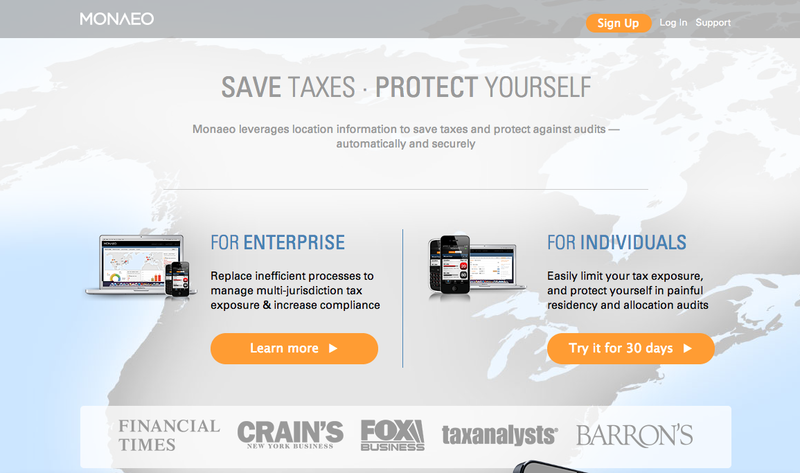 Monaeo also automatically converts this location data into relevant tax information. Of course, privacy is natural concern that arises with anything like this. Monaeo says that their servers, which are powered by Amazon, are as secure as they possibly could be. They also raise the point that the location data that Monaeo gathers (which only provides city, state, and country information) would be less revealing than the calendars and expense reports required in an audit. Monaeo was featured at the Entrepreneurs Roundtable Accelerator’s Demo Day today, along with nine other startups that form this year’s ERA graduating class. You can check out a roundup of startups from our coverage of the event here.